Accommodation, food, wildlife tours and much more are on offer in Telegraph Cove, a popular summertime vacation destination on Northern Vancouver Island. 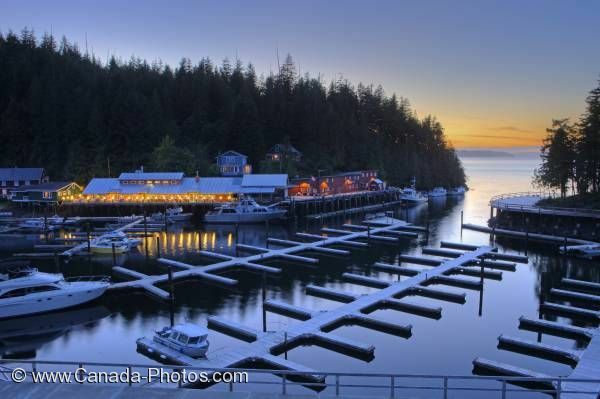 There is also substantial space for leisure boat moorage at Telegraph Cove, a great opportunity for fishing and cruising the waters of Northern Vancouver Island during the day, then enjoying the ambiance of this historic vacation destination and walking the boardwalks in the evening. Historic village of Telegraph Cove, Northern Vancouver Island, British Columbia, Canada.